In order for the wedding to continue, the groom must bring the bride from her room to join him for the engagement ceremony. 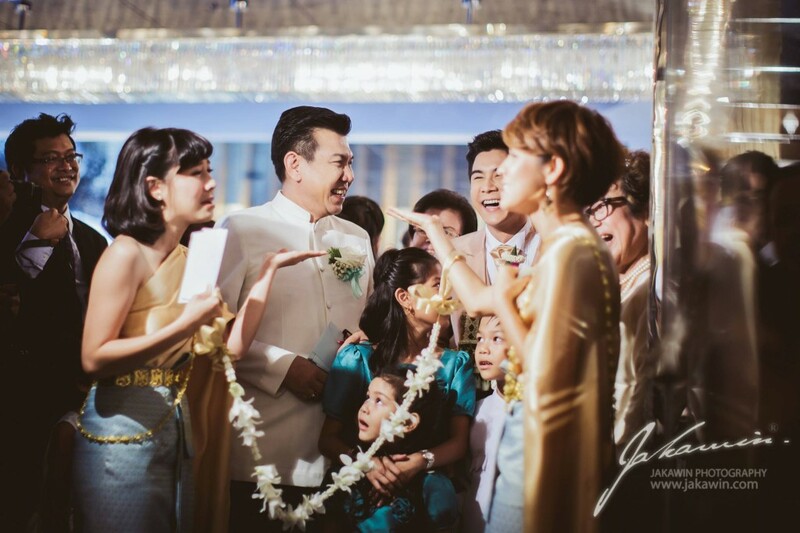 However, before this can happen, the groom must successfully pass through a number of obstacles that are put in the groom’s way by the bride’s family. These symbolic “doors” can only be entered once the groom has proved his worth to the keepers of the “locks”. Normally, there are just 3 of these symbolic “doors” (ofthen represented by a chain), but there may be more. The groom can sometimes be questioned and is occasionally teased during this ritual as the family light-heartedly determined whether he can pass through each “door”, but his passage to the next “door”, or or ultimately to the bride’s room itself, will only be granted once a “toll” has been negotiated with the keeper of the “lock”. The toll for each subsequent “door” will increase as the groom successfully advances. Wow! Thanks for all the information you allways provide uswith Mod. Khap khun khrap maak maak. This sounds very similar to Hindu weddings, not only in India but now here in USA also amongst many Hindu families. The children – mostly bride’s siblings – actually steal his ceremonial shoes and the bride and her family, refuse to allow him near her without the shoes! He has to pay “Toll” to the siblings to get his shoes back to proceed. Since Thailand shares so many things of traditions with India, it is not a surprise. Thank you for the articles.